Kung Pao Shrimp - easy and delicious Kung Pao shrimp recipe that takes 20 mins to make. 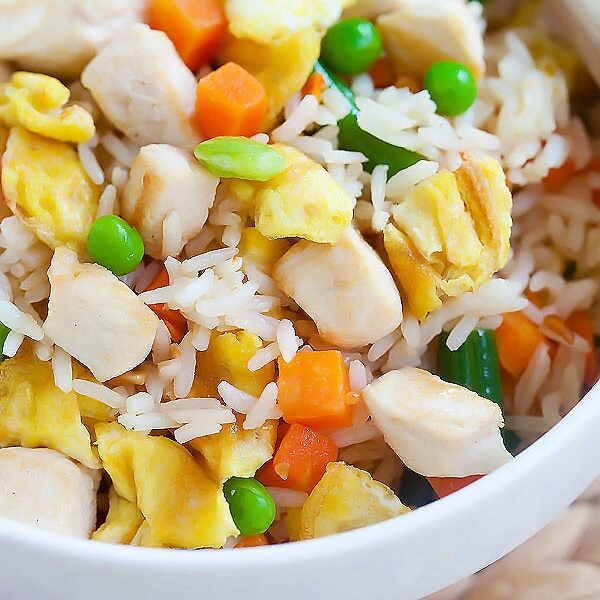 This recipe is so much better and healthier than Chinese takeout. I love the delicious taste of Kung Pao sauce and fresh, bouncy and succulent shrimp. Today, I am going to teach you how to make Kung Pao Shrimp and the authentic recipe of this delicious dish. What Does Kung Pow Mean? Kung Pao (sometimes spelled as Kung Pow) are Chinese recipes that are stir-fried and served with a spicy sauce. The most popular Kung Pao dishes are made with either chicken or shrimp. While I love Kung Pao Chicken, I prefer shrimp because shrimp is briny and tasty. The flavor combination of kung pao sauce and shrimp work like a magic, so much as that some Chinese restaurants call this dish Kungfu Shrimp. This dish offers a great amount of vitamins, minerals, and essential amino acids. This recipe provides a lot of protein while minimizing the fat you might find in a restaurant, and makes a perfect high protein and low carb meal. Shrimp is America’s favorite seafood item, so the next time you have some shrimp in your freezer, just try this absolutely delightful recipe, which takes less than 30 minutes to make. Enjoy! Mix the Kung Pao sauce ingredients and set aside. Heat up a wok and add the cooking oil until the oil is very hot. Add the ginger and do a few quick stirs. Add the onion, green pepper, and dried red chilies. Stir-fry until you smell the spicy aromas from the dried red chilies. Add in the shrimp and roasted peanuts and keep stirring. When the shrimp are almost cooked, add the Kung Pao sauce into the wok, keep stirring until the sauce thickens. Add the chopped scallions, do a few quick stirs, dish out and serve hot. Wonderful pictures… I want to taste your “kung pao shrimp”, it seems so delicious! Dominique – yes, it was delicious, you should totally try. This is fantastic! I’m sure this shrimp version tastes as awesome as the chicken…I will be trying this recipe as soon as I get some black vinegar (have been meaning to buy — love its taste) and kecap manis! I have made with chicken, I am sure going to make with shrimps too. This one looks so so yumm. It is my hubby’s b’day end of june and he as askes me to do a asian menu and am planning to do you yakitori balls and i think i will do this one too. Great that you love my recipes and your husband loves them, too. This looks fantastic! I love Kung Pao chicken, shrimp, and tofu. Can’t wait to try this. I think Kung Pao tofu is such a great idea. Gotta try it. This is a true classic and wonderful dish! The prawns look juicy!! I made your crawfish recipe the other day and it was soooo good! Kung Pao looks pretty good. Yes, prawns are great but you can try with squid and cuttlefish, too. Mouth-watering, makes me want to dig in right now. But unfortunately, it’s just a pic. Id o agree that this recipe would also work using squid(I’ve tried it in a restaurant before), but being more of a shrimp fan, I think your use of prawns or shrimps here would really taste better. That shrimp kung pao looks so tasty! I love your original chicken kung pao recipe and did it many times with prawns after reading your suggestion at the end of the original recipe. I’m now very intrigued by your authentic Sichuan Kung Pao Chicken experience and your plan to revise your recipe. Any head-ups on what to change to make it more authentic? I definitely want to make this at home, I’ve only had it in restaurants. Your photo is gorgeous. And this is the third post with kecap manis I’ve seen today. It is on my shopping list! Tried this last night. It was superb. I had to add a little more cornstarch though to thicken. Fantastic recipe. One question though. The sauce for this is different than your recipe for Kun Pao Chicken. Is there a reason or can the shrimp in this recipe just be substituted by chicken? You should follow my Kung Pao chicken recipe for chicken. The recipe is not the same because of the quantity of the chicken vs. shrimp, also, the presentation is slightly different. For example: no bell pepper and onions in the chicken version. Hi Che, you can just use regular dark soy sauce and add sugar to it. I have a few silly questions (I’m a terrible cook, but I want to make this for my boyfriend)…. Do you make this with cooked, raw, or frozen shrimp? And finally, what temperature do I set the wok on? LOL! I suggest you don’t cook. actually you don’t know everything until you ask , thats how you get better, there was nothing wrong with any of these questions…. it may make you look inexperienced in the cooking dept. but you have to start somewhere. kudos to you for asking before you waste time/ingredients making a dish for you and your boyfriend, hopefully you found out as i see this post is a few years old. Made this tonight and it was really good but didn’t get that dark color like your pic or when you get at a restaurant. I went to our asian store and followed the recipe exactly. I added cornstarch to thicken. Any other suggestions? 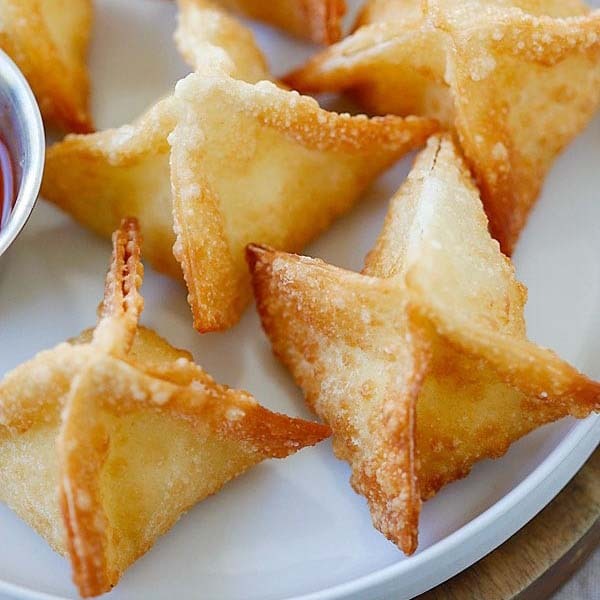 Did you use sweet soy sauce, which is very dark in color? If so, 1 tablespoons and 2 tablespoons soy sauce will make it dark. Great taste.I used to cook little chinese style food on week ends .After few try of your receipe my friends are really enjoying it . thanks and keep it up .Tonight is KUNG PAO fish. Hi, I tried this with success at home.. However I now have to replicate it for 8 people. I might have missed the information from the recipe, however how many servings does this recipe make? Thank you so much and I really enjoy Rasa Malaysia recipes! I had 2 questions- the prawn and does not need to be marinated ? And you have not specified salt in the recipe..is that for a reason? What a tasty dish. Can you specify the amount of shrimp in grams or lbs please? How many serving does this recipe make. Looks really good and would love to try it. Tried it out for dinner last night. My family were licking their fingers. Thanks. Awesome. Thanks for the recipe, this is my go-to recipe when we make kung pao shrimp. I add more veggies and double the sauce, and it makes enough for dinner and leftovers the next day. I don’t love shrimp but with this recipe I think that could totally change! I always love your photos btw! Aww thanks so much Jaclyn. 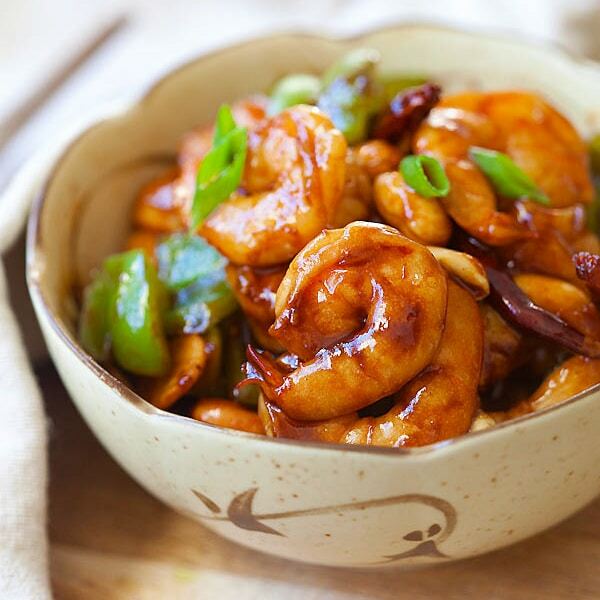 This Kung Pao Shrimp recipe is awesome you should totally try it out. I made this last night and it was absolutely awesome!!!! So flavorful and so easy! My only suggestion would be that you double the recipe so you have leftovers. Great recipe!! I just made this today & had it with congee. Delicious! I tried this! Absolutely delicious! Thank you for the recipe! This looks great. Going to the store now. Finally!I love to cook and have tried numerous Kung Pao recipes. I’ve filed this under “Great Recipes”. Now if I can only find a good moo shu pork recipe. Thanks Rasa! This was really good. My son is allergic to nuts, so I just threw some sunflower seeds in the mix. Thank you! Thanks Marla for trying my Kung Pao Shrimp recipe. The recipe was amazing, however I can’t believe its not been mentioned… the chillies… 10 chillies?? I used 5 and it was the hottest dish I’d ever made. Have I missed something as I would love to perfect this dish. Hi there, it depends on the spiciness of the dried chilies. The ones we get here are not that spicy at all. You can cut down to your heat tolerance level. What is the brand name of chinese black vinegar.In USA we get different variety of chinese black vinegar. Any brand is fine, I don’t have any specific brand in mind. I found this wonderful recipe today and had to try it. I am new to Asian cooking, but willing to try. I recently purchased a wok and have used it once. This was my second time and it was awesome! The directions are simple easy to follow. I surprised myself! Delicious. Thank you for the recipe. I look forward to making more of your wonderful dishes. Hi Rasa, I made this last night and followed it to the letter. I can’t tell you how delicious this was. I used my own dried cayenne peppers from last years garden. They were extremely spicy and I believe added to the deliciousness. I also did not have any sweet soy but clicked on the link and there was a recipe for sweet soy. This was the key. I could have drunk the sauce! I love your book and your all your recipes! Thanks. I was a bit skeptical at first because there was no proper reviews, just posts of people saying they thought the reciepe was nice. Just made some today and it tastes great. I didn’t have actual ginger, so I used ginger powder. Still worked 👌🏾. Also I used Rice vinegar its all they had in sainsburys anyway thanks for the recipe. Will defo cook again for the family. Hi Sarah, awesome, I am glad you tried out my Kung Pao shrimp recipe. You should try more. All my recipes are very good! My kids love shrimps, they will literally devour anything shrimps. We also love Asian food but I haven’t cooked much Asian food at home yet. I am happy to find your blog, so many goodies in here for me. Hi Amira, please try out my recipes, they are all amazing and delicious!